Arrival at Siem Reap international airport. After immigration and customs clearance meet the assigned tour guide and transfer to the hotel. Check in time is normally at 14:00, keys will be given as soon as the rooms become available. Departure for the visit of Angkor Thom, the holy city, the Bayon Temple with more than two hundred amazingly carved faces of Lokeshvara, Pimehanakas, temple of the legend between the King and the Naga, the area where was located the Royal Palace, the Elephant and Leper King Terraces. Lunch at good local restaurant. During the afternoon visit the pink sandstone temple of Bantey Srei, or the citadel of the women, located at about 35 km from Siem Reap. Carvings in this temple are amazing. On the way back to Siem Reap see Bantaey Samre temple, which is related to the legend of the normal villager who became a King. Dinner in good local restaurant with Apsara Dance show. 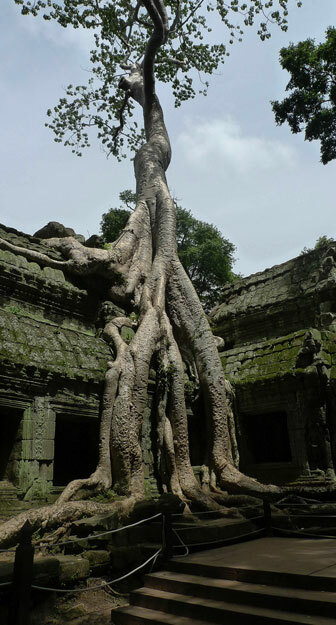 Entire morning to explore the wonders of Angkor Wat, the masterpiece of all Angkor era. In the afternoon see the grand circuit of Angkor, Prae Khan temple, or sacred sword, Neak Phean, a sort of purification sanctuary and the last temple to be seen will be the Tha Phrom, one of the most impressive, where nature seems to have preserved the area, with huge trees all among the ancient ruins, and left on purpose as it was found by French archeologists in the 1860. Accommodation as per requested hotels. Private air conditioned transportation as per program. Cold water and fresh towels at disposal. English speaking private local tour guides. 1 FOC in half twin every 15 fully paying . Air tickets to and from Cambodia. Visa Fee (USD 20, 6 MONTHS PASSPORT VALIDITY, 1 PHOTO, 1 PAGE AVAILABLE). Airport taxes: domestic USD 6 and international USD 25 per person. Drinks at meals and extras in general. Money transfers bank fees and what is not mentioned in included.